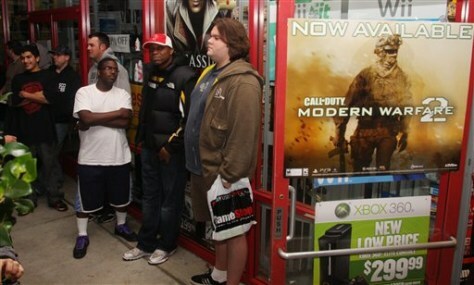 Video game fans wait in line outside a Game Stop in Redwood City, Calif. to purchase "Call of Duty Modern: Warfare 2", which was launched Tuesday at one minute after midnight. First-day sales of Activision Blizzard "Call of Duty: Modern Warfare 2" broke records, raking in an estimated $310 million in North America and the United Kingdom alone. Overall sales in October for video games dropped from September, analysts say.